Imagine trying to work a party while tethered to your wife or husband? Doesn't sound like much fun, huh? That's probably how our dogs feel when they cannot have some off leash time with their friends. 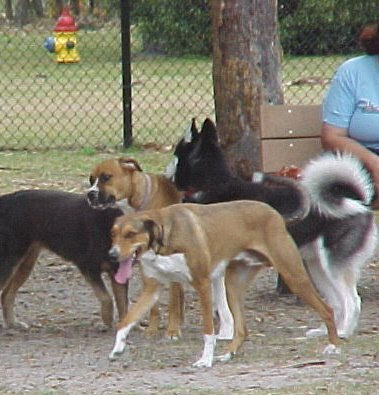 Weekends at the dog park are so empowering for me. Watching the dogs play in such a purely innocent way is delightful. That doesn't mean there isn't an occasional disagreement. There would be at a human park, as well. Diligent owners stay within sight of their pups and ready to intervene in case of a problem. Intervene, how, you ask? The safest way to break up a scuffle between two or more dogs is to grab your dog by his hips and back him out of it. 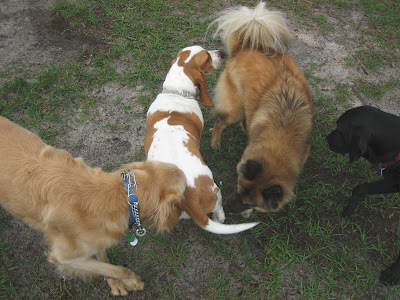 Most of us can overpower our dogs when we have control over their hind quarters. This method of intervention prevents dog bites, because your hands are not in the thick of the action. During a doggie disagreement, dogs lose their composure. They don't know who or what they are snapping at once they lose it. So your own dog could be the culprit in a bite to your hand if your hand is in the mix. This rule includes steering clear of trying to grab them by their collar. During a fight, a dog's movements are erratic and quick. Trying to grab a collar could easily end in a wounded hand, as well. If your dog is not involved, you can help out safely by grabbing a bucket of water and plopping it squarely on the faces of the involved pups. This often will scatter the group, giving the owners time to claim and calm their charges. If your own dog is involved, assure that he is relaxed and ready to play before releasing him. If his energy is still assertive or aggressive, perhaps its time to call it a day. You can finish him off with walk at home, allowing the rest of the park visitors to resume play without worry. 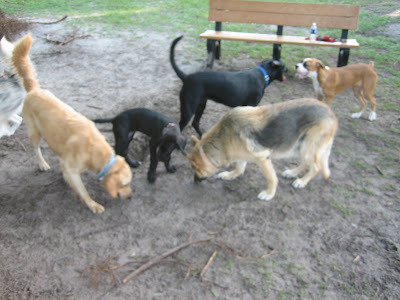 Marmaduke is a new addition to our regular weekend dog park group. He's going to be quite a big boy, so his owner is doing the right thing--socializing him early to assure he is friendly with both humans and other dogs. 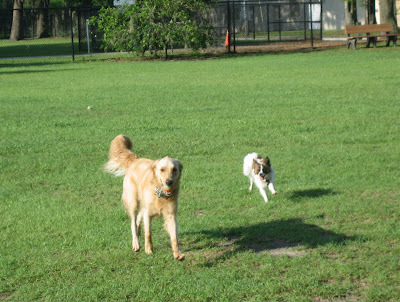 While Oliver can rarely keep pace with Tanner in the long stretch, his sprint is quite impressive. This tag game has been going on for a few minutes, so poor Oliver is being left behind. I'm glad to see he hasn't given up. It's so good for him to run, and I'm glad he's confident to run with the big boys. Tag is a great game for dogs of all kinds, and it requires no props to play. My pack and I wish you a very happy Independence Day and a great romp at the park.